Andy Robertson believes Scotland have the strikers to outgun Polish goal machine Robert Lewandowski in tomorrow night’s Euro showdown at Hampden. Bayern Munich hitman Lewandowski has claimed an incredible 12 goals in his last four matches, including a sensational five strokes in just nine minutes against Wolfsburg two weeks ago in the Bundesliga, and is also the leading scorer in the qualifying campaign for next summer’s finals in France with ten. But while admitting the 27-year-old poses a major threat, Robertson pointed out his own team-mates Steven Fletcher, Leigh Griffiths, Chris Martin and Jordan Rhodes were all on target at the weekend, while Everton’s Steven Naismith notched a hat-trick against Chelsea last month. Robertson, naturally, accepts Lewandowski poses a major threat but, he insisted, the Scots can’t regard him as the sole dangerman, pointing out that while Gordon Strachan’s side had shut him out in Warsaw a year ago, Krzysztof Maczynski and Arkadiusz Milik had scored Poland’s goals in that 2-2 draw. Milik himself has outdone Shaun Maloney’s four goals for Scotland in this campaign by scoring six, goals which have put Poland in pole position to qualify alongside world champions Germany. Robertson said: “Lewandowski is probably the man of the moment in Europe just now, outshining both Cristiano Ronaldo and Lionel Messi just because of the amount of goals he has scored. He came on at half-time against Wolfsburg and scored five in ten minutes. “But the one thing you can’t do is focus on one player. If you do put all your eggs in one basket then someone else will pop up. Poland are a very good squad and that’s why they are in the position they are in. They are still pushing for first place. “You see Lewandowski scoring all these goals, but we have to look at ourselves. We have to try to create our own chances because trying to keep him quiet isn’t going to win us the game. “Yes, it will help stopping him scoring because a lot of things come off him. He is in fine form just now and if we can keep him quiet it will be a big push towards the right result. Scotland currently lie fourth in Group D, four points behind the Republic of Ireland in the play-off berth in third place and, as things stand, Strachan and his players are well aware they are in danger of being the only home nation not to qualify for the finals. Moreover, the feelgood factor which an impressive campaign had engendered has all but evaporated following a disastrous 1-0 defeat in Georgia last month a few days before Germany won 3-2 at Hampden. Robertson said: “The Georgia game was obviously disappointing. In the Germany game I thought we did well and didn’t get the luck to get the result. We can’t dwell on it. I think we still needed to beat Poland in any case regardless of those results. We lost three points against Georgia and we have to try to make that up now. “We are just determined to take this country back to a major championship. I think if you look at the other home nations’ groups, our’s is probably a lot harder. England and Northern Ireland, I think, have got it quite easy. Obviously they still need to do the job and qualify, but I think we’ve been dealt the toughest group. Robertson knows the atmosphere at a sold-out Hampden will be a heady mix of anticipation, excitement and trepidation but, the Hull City defender insisted, those chosen by Strachan have to keep their cool and display a degree of patience that won’t be matched by the Tartan Army. The 21-year-old said: “Everyone knows how big a game it is and what result we need to get, so I think it’s more the squad are excited to be back together to try to get the three points we need. “It doesn’t matter when we score, but obviously an early goal is nice because it settles everyone down. What we have to do is create chances and hopefully the people who get them take them. Despite the disappointments the last qualifying double-header brought, Robertson believes the squad gathered at their west of Scotland base this week refreshed and ready for the daunting task ahead. Robertson insisted his own morale was high, Hull having hit a good run of form following the disappointment of being relegated from the English Premier League to the Championship. He said: “So far so good. I don’t think we’ve hit the highs that maybe we once did, but we are picking up results and that’s all that counts. As happy as he is, Robertson admitted to a pang of sympathy as he saw his old Dundee United boss Jackie McNamara sacked as the Tannadice club hit the bottom of the Scottish Premiership, the Terrors having been weakened by the departure of a host of top players, the huge fees earned counting for little in terms of points. 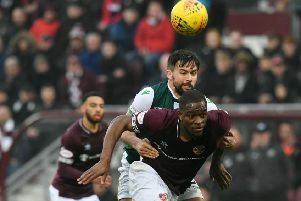 Robertson, who moved to Hull in a £2.85 million deal, has been followed out the door by the likes of Ryan Gauld, Gary Mackay-Steven, Stuart Armstrong and Nadir Ciftci, the latter trio all joining Celtic. The left back said: “I think all the boys that are away from there don’t like seeing the club at the bottom of the table. It’s always tough when you lose that many players, but you have to try to move on quickly, get someone in and hopefully the players can start clicking again. “The gaffer doesn’t have control over players leaving – at the end of the day it’s higher up than him. Once a fee is accepted he can do nothing about it, so I do have sympathy for him, but I think the fans look at it and blame the manager a bit. That’s harsh on him, but at the end of the day the results were not there so the fans were always going to turn on the players, the manager, or whatever.